Congratulations to Ms. Wheelchair Maryland 2010 Shannon Renade Lavine Minnick from Silver Spring, Maryland. Shannon was crowned at the Doubletree Hotel in Bethesda, Maryland on November 7, 2009. Shannon will represent Maryland at the Ms. Wheelchair America pageant in Grand Rapids, Michigan in August 2010. Ms. 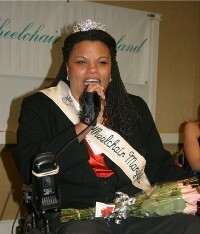 Wheelchair Maryland 2010 was crowned at the Doubletree Hotel in Bethesda, Maryland on November 7, 2009. The gala consisted of a mock platform speech based on a dancing with the stars like scoring system. There was a round table discussion with former Ms. Wheelchair Maryland titleholders, platform speeches, 2 rounds of judges questions, fish bowl questions, and the gala followed by dinner.